Yves Saint Laurent’s ‘Danger Red’ lipstick campaign has been setting loins astir with a concept that’s aimed at evoking passion, temptation, love and desire. Who better to personify ‘flirting with danger’ than Rain, Korea’s top pop sensation? He had been selected by the Loreal Group to be this year’s face of strength and sensuality for the Asia market, specifically Chinese-speaking countries. Directed by Chinese director Wang Limin who is known for his high-profile commercial work with brands such as Mercedes Benz, Chivas, Adidas and Uniqlo, he was approached by YSL to pick his brain for ideas. In the end, Wang took the lead in becoming the primary creative force behind the project by multi-tasking as director and writer and putting together the entire production team. 导演王砺珉完成了一天拍三条短片的“不可能任务”。Director Wang Linmin on the set. 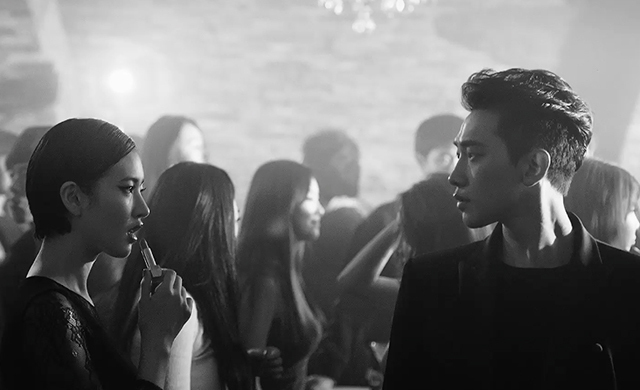 The timely release of three commercial episodes featuring Rain and sultry Korean model, Yoo Ji Ann couldn’t be more apt with the advent of Valentine’s Day. But it isn’t the typical rose petal or chocolate box romance that drives the trilogy. ‘Danger Red’ like its name suggests, is about defying convention – to simultaneously shock and seduce. Provocation is what inspired Wang to work in film noir. The only flush of colour depicted is Yoo’s red-hot lips, bringing to mind similar cinematography in motion pictures Pleasantville and Schindler’s List, where colour symbolizes transformation of an otherwise dull black-and-white existence. For Wang, it is the fatal and inexplicable attraction that is inherent in the red that influenced his elevator and club scenes. Wang chose a small vintage elevator with the intent of building the mystery between Rain and Yoo. Owing to limited time, he filmed only Yoo who in turn successfully delivered the air of elusiveness in such a narrow space. In the end, Yoo’s solo performance makes for a great transition to the club episode with Rain embarking on a wild goose chase of Yoo through a the smokey underground. His tenacious pursuit proves fruitless and we’re left with a glimpse of Yoo rouging her lips before disappearing into the crowd. What is more intriguing is Wang’s alternate version of this same scene with Yoo drawing her lipstick above the lip, literally ‘drawing outside the lines’. She brandishes the upward curl of a moustache that is at once reminiscent of the Guy Fawkes-masked vigilante in V for Vendetta. Needless to say, the subversive moment didn’t make the cut. YSL thought it misleading and incongruous with the brand image. An irony, perhaps? But a super cool spot, nonetheless. If you want to know more about director Wang Limin, you can see our exclusive interview here.